"Last year we saw tens of thousands of students nationwide take to the streets to demand action to stop mass shootings and stem the epidemic of gun violence that plagues our communities," Feinstein said in a statement. "Our youngest generation has grown up with active-shooter drills, hiding under their desks—and now they're saying enough is enough. Americans across the nation are asking Congress to reinstate the federal ban on military-style assault weapons and high-capacity magazines. If we're going to put a stop to mass shootings and protect our children, we need to get these weapons of war off our streets." Feinstein's office said the bill will resemble similar legislation the senator has introduced in previous years. However, they said the updated bill will include a ban on "assault pistols that weigh 50 or more ounces when unloaded," a ban on pistol stabilizing braces, and a ban on "Thordsen-type grips and stocks that are designed to evade a ban on assault weapons." Cornyn's bill, the Constitutional Concealed Carry Reciprocity Act, would require states to honor one another's gun-carry permits. The text of the bill has not yet been released but Cornyn's office said it would allow those with gun-carry permits issued by their home state to carry a gun in any other state so long as they adhere to local gun-carry laws. The bill would require a resident to obtain a gun-carry permit from their home state in order to be able to carry in all states. "This bill focuses on two of our country's most fundamental constitutional protections—the Second Amendment’s right of citizens to keep and bear arms and the Tenth Amendment's right of states to make laws best-suited for their residents," Cornyn said in a statement. "I look forward to working with my colleagues to advance this important legislation for law-abiding gun owners nationwide." The National Rifle Association has long opposed a national assault weapons ban and announced last year the national reciprocity policy in Cornyn's bill is "our number-one legislative priority." The gun-rights group said Americans ought to be able to carry guns regardless of what state they are in. "The current patchwork of state and local gun laws is confusing and can cause the most conscientious gun owner to unknowingly run afoul of the law when they are traveling or temporarily living away from home," said Chris W. Cox, executive director of the NRA's Institute for Legislative Action. "Sen. Cornyn's legislation provides a much-needed solution to a real problem for law-abiding gun owners. Law-abiding citizens should be able to exercise their fundamental right to self-defense while traveling across state lines." Feinstein's gun ban is being cosponsored by most of the Democrats in the Senate and Cornyn's national reciprocity bill is being cosponsored by most of the Republicans. 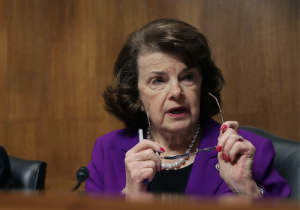 Feinstein had previously sponsored a successful assault weapons ban in 1994 but has faced greater opposition to the proposal since the ban sunset in 2004. Cornyn's national reciprocity policy garnered 57 votes, including 13 from Democratic senators during the Obama years but has yet to receive a vote during the Trump administration. The Senate now has 53 Republican members and 47 members who caucus as Democrats, making either piece of legislation a longshot to ever see final passage or even a floor vote.